It’s been a dramatic few days for global markets as the near universally expected “Bremain” turned out to be a shocking “Brexit” instead. The S&P 500 was complacently resting near all-time highs the night before the vote, but a few short hours later we found ourselves in the middle of a panic driven selloff. Friday’s selling extended through Monday morning, but by Monday afternoon we were running out of fearful sellers and found support near 2,000. Then Tuesday we surprised nearly everyone when we rebounded 1.8%. The question on everyone’s minds is what comes next? Is this a dead cat bounce before tumbling lower, or is the worst already behind us? It’s been analyzed to death from countless other sources, but the Cliff Note’s version is the Brexit is more political than economic, especially when viewed from U.S. shores. A strong dollar, weak oil, and potential economic slowdown in Europe will be headwinds for our energy and export companies, but this is nothing new. Our service based and import heavy economy survived these headwinds all year and this is largely more of the same. This means the “Brexit” selloff is a buying opportunity, not a precursor to something much worse. If anything, this political uncertainty delays a Fed rate hike on the short end of the yield curve and the flight to safety is pushing down yields on longer end. Low interest rates leads to investors bidding up the prices of stocks and the risk to the markets from increasing rates gets put off yet again. That’s the big picture. But what we really want to know is how to trade this and for that we need to zoom in. The Brexit is a large, ambiguous mess that no one understands because nothing like this has happened before. It would be a mistake to assume two-days of selling is all it took to fully price in the risks and headlines that will come out over the next weeks and months. While it was nice to see global markets bounce Tuesday, it is premature to call this thing over. Currently the market is expecting a rather smooth and painless transition for Britain. But all it takes is for one loud-mouthed politician to start spouting off that now is the time to reconsider and renegotiate these free trade agreements. Or another from Europe to say that London won’t get a free pass and needs to suffer the consequences of their decision. Right now politicians on both sides of the English Channel are humbled and meek from this gigantic rebuke. But give it a couple of days and soon they will find their big mouths again. When they do, expect the market to shutter and reel. At best we should expect the market to remain range bound for a while. That means these pops should be sold, not chased. We will survive this and pull out of it this fall, but expect it to be a bumpy ride between now and then. What can we learn from this? Was the vote as unpredictable as people are claiming? I’ll be the first to admit I fell for it. I was nearly certain Britain would vote to stay in the EU. But just because that was the most likely outcome doesn’t mean it was a good trade. The previous runup in price ahead of the vote created a very poor risk/reward and is why I chose to be in cash ahead of the vote. 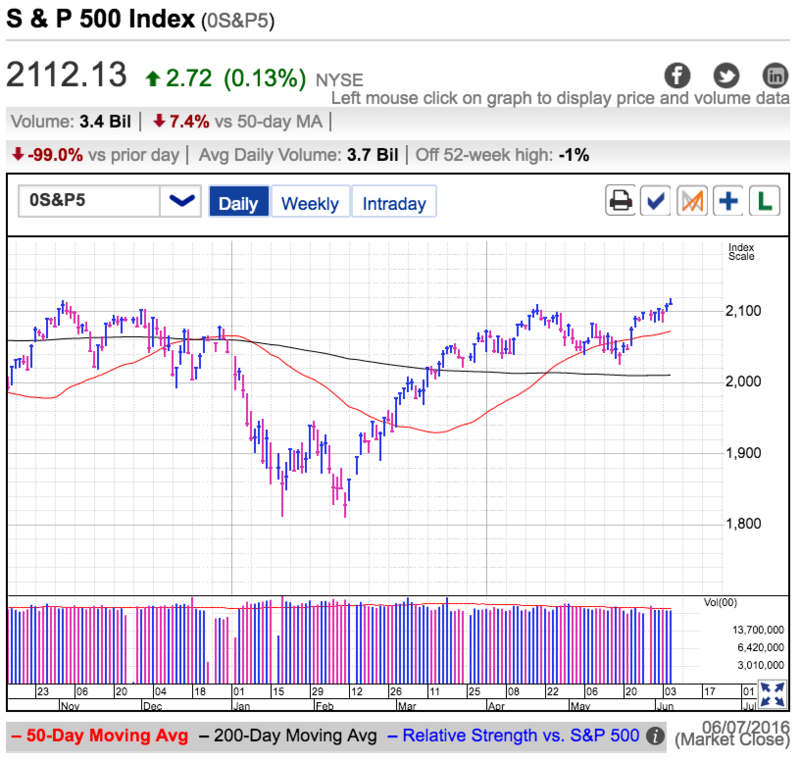 Traders are fixated on Thursday’s Brexit vote and this drift up to 2,100 resistance tells us the crowd is optimistic and expecting a favorable outcome. This positive outlook is somewhat unusual because more often than not the market fears uncertainty and typically prices in the worst, but this time traders are buying ahead of what they think will be a Stay result. Unfortunately for those positioning for pop, they will be disappointed because a big chunk of this buying is happening ahead of time. If no one is left to buy the headline, we could actually stumble into a sell the news situation. The market hates to be predictable and right now the least expected outcome would be a selloff following what most bulls are hoping for. While I agree with the crowd that a Stay vote is the most likely outcome, I don’t want to buy ahead of the vote because much of the upside has already been realized. Since this Brexit drama never really pressured prices, there is not a lot of upside to be realized once this weight is removed. While we could surge 20-points in a knee-jerk relief rally, we could also open down 40-points if the Leave crowd surprises everyone. That is a poor risk/reward even if the reward is a higher probability outcome. 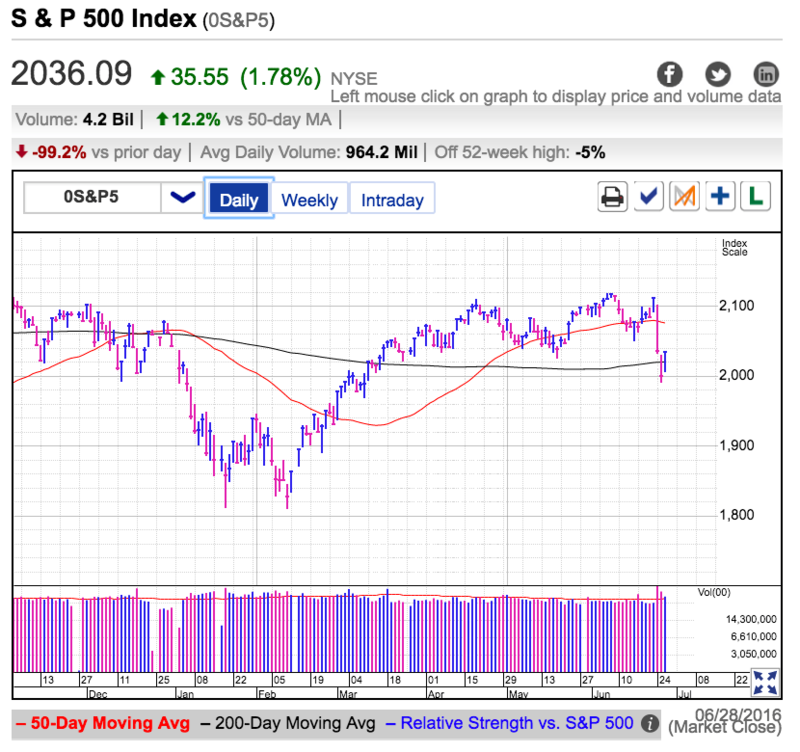 Tuesday morning the S&P 500 extended its selloff, crashing through 2,080 support and the 50dma on its way to the mid-2,060s. But by late morning we exhausted the supply of sellers and closed 10-points off the intraday lows. Justifications for this week-old selloff come from two sources, oil pulling back from its highs and growing fear of a Brexit. Last Tuesday evening I warned readers to be wary of a near-term pullback in oil and equities and that is exactly what happened. We don’t need be psychic to know what the market will do next, all we have to do follow the swings of sentiment and supply and demand. Last week traders were giddy as oil broke through $50, leading many to predict $60 oil wasn’t far away. Instead of surging higher, oil prices peaked and stumbled back into the $40s. So much for the wisdom of consensus. 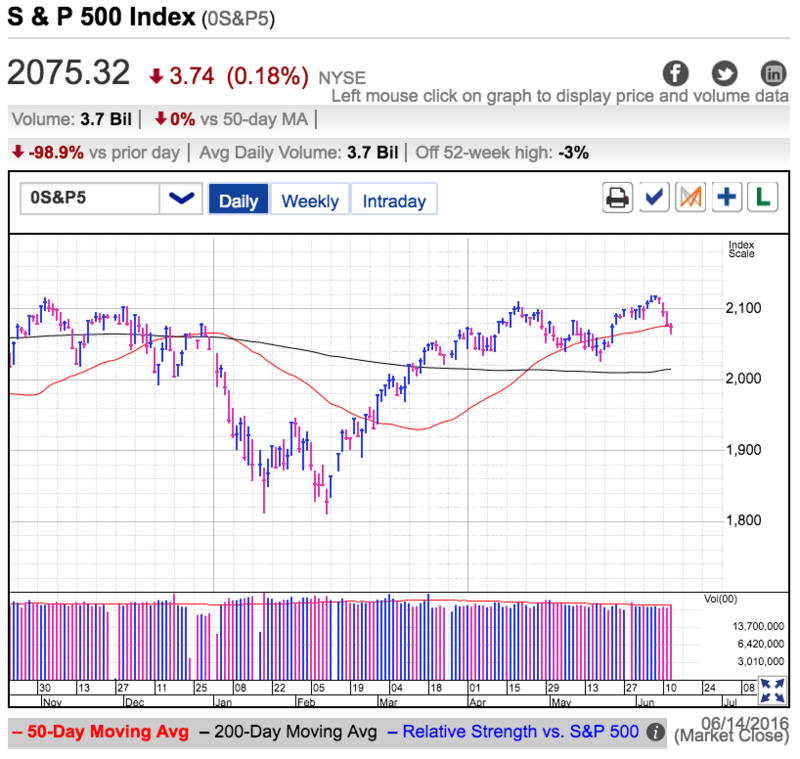 Stocks followed the same flight plan when it looked like we were headed to all-time highs, yet found ourselves stumbling under the 50dma instead. But that’s the way this works. One week’s giddiness gives way to the next week’s pessimism. This week oil prices have been bumped off the front pages as the financial press fixates on next week’s Brexit vote. This was supposed to be a slam dunk for the “stay” vote, but the Brexit camp has surged in recent polls. That uncertainty is unnerving markets as traders start to fear the unknown. While this will be a hugely disruptive event if Britain votes to leave the EU, the economic consequences will be less bad than most fear. This is a referendum on refugee immigration, not trade. British citizens want to close their borders to Middle East refugees and given EU laws, the only way they can do that is by pulling out of the union. This isn’t a dispute over trade and no one wants to start a trade war since both sides are so dependent on the other. This means we should expect British and EU politicians to quickly sign into law comparable trade agreements to replace the previous EU ones. This will take place within weeks if not days because both sides want to minimize the economic disruptions. But politicians are not promoting “Plan B” because they are trying to use fear of economic calamity to persuade people to vote “stay”. A Brexit vote would send the S&P 500 down a few percent because it is not currently priced in. But this will be a buyable dip for those who have the courage to be greedy when others are fearful. A week or two after the Brexit vote, many of the unknowns will have been ironed out and we will move forward with a plan. Norway and Switzerland survive quite successfully without EU membership and instead are part of a European Free Trade Association. Britain will do the same thing and life moves on. Since Britain never adopted the euro and still used the pound, there won’t be any of the financial entanglements that drove concern over a Grexit a couple of years ago. All the Brexit is doing is shifting from standardized EU trade agreements to ones made separately. Six one-way, half-a-dozen another. For all intents and purposes it will do the same thing no matter what the document is called. As for how to trade this, Tuesday’s dip undercut popular technical stop-losses, purging a good bit of that supply from the market. The relentless slide under 2,070 also combined with the Brexit headlines to convinced emotional traders to get out “before things get worse”. Unfortunately for them reacting emotionally doesn’t pay very well. While the Brexit story isn’t done, we are closer to a buy-point than a prudent place to sell defensively. 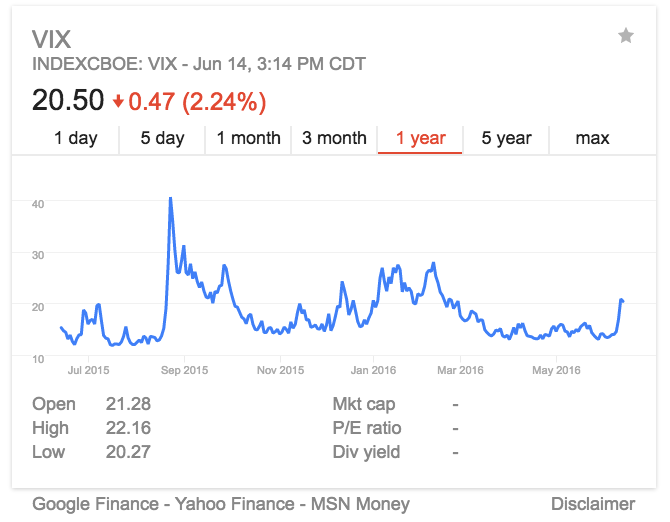 The best profit opportunities come from trading against an emotional crowd and the anxiety is ramping up as the VIX surges above 20 for the first time since February. Those with cash, get your shopping lists ready. Those with buy-and-hold stocks, don’t let the fear-mongering convince you to sell at a discount. The S&P 500 carved out fresh 2016 highs Tuesday, a long way from the February doldrums that lead to widespread predictions of doom-and-gloom. The biggest question is if we should buy this breakout, or short the upper end of a summer trading range. The day’s other big headline is oil closed above $50 for the first time this year. A nearly 100% gain in a few short months persuaded many to predict a continuation straight to $60. The problem with consensus is it’s rarely right. If everyone is convinced oil has another $10 of upside, then it seems like an easy buy. Unfortunately for us, very few things in the market are easy. This nearly universal bullishness makes me suspect a near-term top is just around the corner. No doubt we can get to $60, but most likely it will be bumpy ride with many confidence shattering gyrations along the way. Since oil’s breakout above $50 is an obvious buy-point, many oil traders have already bought and incremental demand will be harder to come by. With a scarcity of new buyers, what is going to push the price higher? The story for the S&P 500 sounds a lot like what I just described for oil. While we’re near all-time highs, what catalyst is ahead of us that will convince people to buy stocks at record highs? A lot of institutional money managers are on summer vacation, leading to the typically lower volume we see this season. If big institutional money isn’t around to buy, who else has the firepower necessary to sustain a continued move higher? If we cannot answer that question, it is hard to get excited about this breakout. This week the stock market rebounded from the slowest hiring numbers in half a decade. Rather than fear economic slowing, traders cheered the Fed’s postponed interest rate-hike. I don’t know about you, but I would more bullish if the Fed hiked interest rates because the economy was doing well, not the other way around. This excitement over a stagnant economy doesn’t make a lot of sense and is most likely only a reactionary phenomena. Delaying the second rate-hike a few months isn’t going to do much to improve corporate earnings and thus will have a limited impact on longer-term equity prices. As for how to trade this, the last couple of days looked more like short covering than sustainable breakout buying. Shorts were forced to cover when we rose above their stop-loss levels. But often the point of maximum pain is where the market reverses. Surging to 2,120 would have led to widespread capitulation as most bears gave up ahead of the “inevitable” runup to all-time highs. But this afternoon the air was let out of the breakout as most of those early gains fizzled and we returned to near break-even. That lack of follow-on buying is a big red flag for bulls. We want to see people chasing this breakout, not taking profits. If we hold above 2,100 through the remainder of the week, then the situation looks good for bulls. But if we stumble back under 2,100 so soon after the breakout, look for a return to at least 2,080 and more likely 2,060. Trade accordingly.